Robert Rankin is the UK's second-biggest-selling writer of comic fantasy (after Terry Pratchett) but is a rather different humourist to his knighted colleague. Whilst Pratchett deals with satire, Rankin is much more of an absurdist and surrealist (or, indeed, an absurd surrealist) who comes across as a mix of Jack Vance and Spike Milligan after they've gotten spectacularly drunk and torn up the town. 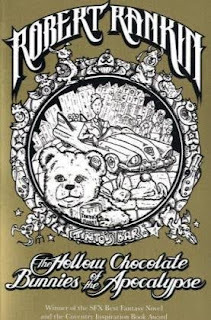 His books have a reputation as being somewhat impenetrable for the newcomer, consisting as they do of myriad references and running gags spanning dozens of novels (The Hollow Chocolate Bunnies of the Apocalypse is Rankin's 24th novel, of 32 published to date), although in practise there are several viable entry-points, with this novel - set in its own reality unrelated to the 'Brentfordverse' of most of his other books - being one of them. The premise is both barmy and logical, clever and slightly derivative. The idea of there being a place where all the fictional toys and nursery rhyme characters live together isn't exactly new, but the depiction here of Toy City being dirty, run down and slightly seedy (Old Mother Goose is the madame of a high-class brothel) is well-handled. It's a little bit of a shame that Rankin doesn't wander further from his comfort zone by maybe treating the premise more seriously, more like a real noir thriller which just happens to be set in Toy City, but the result is nevertheless still entertaining. Rankin cleverly uses the classic nursery rhymes to build up a cast of interesting characters and riffs off the standard detective fiction tropes in an appealing (and sometimes metafictional) manner. For newcomers, this is also (despite the premise and title) Rankin at his more restrained, with a notable lack of sentient time-travelling vegetables providing the impetus for the action. There is one major issue. If you are familiar with Rankin's other books, this one, despite its unique setting, will be very familiar. Several recurring gags reappear, with Jack, like every single other Rankin protagonist of note, coming into possession of a minigun at one point in the narrative for the purposes of causing havoc (although, possibly in deference to the setting's lack of modern cultural references, it is not described as being "like the one Blaine had in Predator,"). The presence of two protagonists, one tall and handsome and the other short and slightly seedy, is also a recurring Rankinism, seen in his other double-acts such as Cornelius Murphy and Tuppe of the splendid Book of Ultimate Truths. In short, seasoned Rankin fans may feel disappointed at the over-familiarity of events, whilst newcomers will likely enjoy it more. 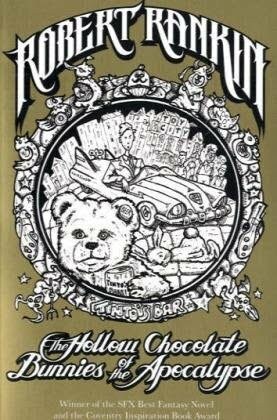 The Hollow Chocolate Bunnies of the Apocalypse (***½) is an amusing, occasionally hilarious slice of comic fantasy which makes a perfect entry-point for newcomers to Rankin's work, whilst more seasoned readers may find the experience enjoyable but also a little predictable. The book is available now (with new artwork) in the UK and on import in the USA. First part of his Armageddon Trilogy available for free right now!